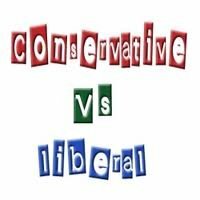 LIBERAL VS. CONSERVATIVE PERSONALITIES « THE BRYCE IS RIGHT! – Are liberals smarter or is it a matter of different wiring? I have always been fascinated by the disparity between liberals and conservatives, particularly as witnessed in the last electoral cycle. The contrast is as sharp as black and white. It’s as if two different races of people occupy the land with totally different perspectives and values. I’m not sure why this is, but I want to give my two cents on the subject. A couple of years ago there was considerable discussion regarding the thesis that liberals were smarter than conservatives. A couple of college research studies, one in the UK and another in the United States, suggested as much. In reality, these studies offered theories, and were far from conclusive. Frankly, I’m not sure IQ is a good measure, as I know plenty of people on both sides of the aisle who could score high marks on intelligence tests. Instead, maybe it’s a left brain/right brain type of phenomenon. My stereotype of liberals is as a group of very creative people, almost artistic in nature. Such people feel inhibited by rules and boundaries as it frustrates their creativity. They prefer shattering regulations in order to enjoy complete freedom. In contrast, conservatives flourish under rules as it offers the structure and organization they desire to provide them with direction. They may not be as creative as liberals, but they can be craftsmen of the highest order as they comprehend the disciplined process for building something, and the penalties for violating a step within it. In this respect, the difference between liberals and conservatives is essentially no different than art versus science. An art form relies on the intuitiveness of the person performing the work, something that is difficult, if not impossible, to pass on to another human being. For example, apprentices serving under an artist may try for years to emulate the master, but may never attain his level of skill and creativity. In contrast, a science is based on a governing body of proven concepts and principles and, as such, can be easily taught to others. What I am suggesting herein is that liberals tend to gravitate to art, and conservatives towards science. Whereas liberals yearn for unbridled freedom of expression, conservatives prefer a methodical approach for living their lives. There is perhaps nothing better to exemplify the difference between liberals and conservatives than school uniforms. While conservatives tend to embrace the concept, liberals reject it out of hand claiming it will inhibit the individuality of their offspring. In contrast, conservatives view it as something positive, promoting teamwork and cooperation. This may explain why conservatives are more likely to embrace traditional values as opposed to breaking with them. Liberals bristle at such a notion. Their permissive attitudes tend to challenge the norms of the day. There are those who suggest liberals are more compassionate, but I do not agree with this premise. Time and again, I have seen conservatives generously lend a helping hand both in terms of time and money, particularly those with a deep religious faith. However, they tend to go about it more quietly than their liberal counterparts. As an aside, I tend to believe liberals avoid religion, not because they question spirituality, but because organized religion embodies a collection of governing rules to live by. So, are liberals smarter than conservatives, or is it a simple matter of different wiring based on the art versus science analogy? I tend to believe liberals live in the abstract world of “What if,” while conservatives live in the pragmatic world of “What is.” It is more about ego than it is about intelligence. This entry was posted on September 27, 2018 at 7:00 am	and is filed under Politics. Tagged: Florida, LIBERAL VS. CONSERVATIVE PERSONALITIES, palm harbor, The Bryce is Right, tim bryce. You can follow any responses to this entry through the RSS 2.0 feed. You can leave a response, or trackback from your own site.